OK, this product is just weird. Freeze dried green beans, somehow processed with canola oil, dextrin & salt to become a crunchy snack. I get it -- a salty crunchy snack with a low glycemic index and lots of fiber. But i tried a few just now, from the box that I got from my parents for Christmas, and they're just somehow *wrong*. They do taste identifiably, if faintly, like green beans, which is nice, but with a faintly unpleasant sweet taste, and a few hard bits mixed in with the crunch, like when you get Corn Nuts that are a little over-cooked and you think you're going to break your teeth. (I don't eat Corn Nuts anymore either, so maybe I have a thing.) I had to put the lid back on the box and stop after like 4 beans, and i still have a little icky feeling on my tongue which i might have to drown with a few Utz Cheez Balls. This is one of the more notorious specialties of Hawai'i, but I'll tell ya, these little buggers are awfully tasty. And handy, too -- when you can nip into any convenience mart and snag a portable block of tasty handheld carbs+protein+fat, for less than 2 bucks, and be back on your way to the beach, there ain't nothin' not to like about that. I think every single spam musubi we bought on the islands was different than the others, which is hilarious. Some have teriyaki sauce, some have panko crumbs, some have egg, some have furikake, some are plain. Sometimes they're in the hot case, sometimes out at room temp (rarely in the fridge, these people are respectful of their rice). 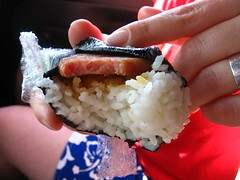 But my most favorite of all of them was the first, the hot-case teriyaki-brushed spam musubi clearly handmade by someone at the Kukui'ula Market on Kaua'i, between Kahoa & Poipu. They were the most flavorful, thanks to the play between sweet-savory teri sauce and salty-savory spam, and the rice was warm and soft and held together just right. The nori got a little chewy, but i can overlook such a flaw. 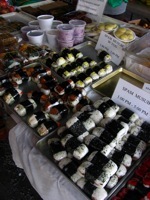 Once we found these, i think we ate at least one every day the rest of the time we were on Kaua'i. Whilst downtown today, i walked by a little hole in the wall labeled "Pita Kebab" that had a newspaper review on the window that said it was Persian and had great kubideh. 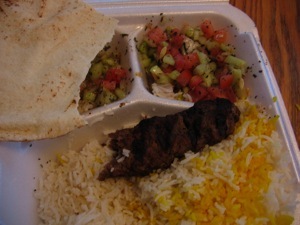 I stopped in for lunch, and though that kubideh was perfectly fine, especially for wicked-fast takeout, it wasn't all that. The clipping said it was richly spiced, delectable, etc., and frankly I didn't detect much spice at all, and it desperately needed salt. Ditto on the rice: fragrant and tender, but a little bit bland, in dire need of some nice salted butter. The chopped salad, however, was top-shelf, super flavorful and lemony and minty, yum yum. So Molana is better, though twice the price, and my own kitchen is better even than that, but if you work in the Downtown Crossing/Chinatown area, it's a nice change of pace for lunch takeout. I just finished off the box of Trader Joe's Sea Salt Dark Chocolate Caramels, and felt moved to blog. These are great. More please! Actually, i do agree with the assessment on the site i linked to above -- they are not perfect, i have had better caramels -- but damn, I sure do like caramel + dark chocolate + big crunchy hunks of salt. Short of a trip back to LA's Little Flower Candy Company, which sold me the best freaking salt caramels I've ever eaten, this massmarket treat will most certainly do. oh. my. god. Best Burger Ever. It may have been the fact that we'd been surfing all morning and were really really hungry, but even in retrospect the Local Girl burger at Duane's is well into the top 5 burgers of all time, no question about it. First of all, the burger itself is perfect -- not too thick, just thin enough to balance with the toppings, and well-cooked. Then you factor in the usual lettuce-and-tomato being yummy because, well, you're in Hawaii, and then things just get crazy: teriyaki sauce, pineapple, swiss cheese and mayo. These add up to one insanely good treat, but really it is the combo of mayo with teriyaki that makes my eyeballs roll back into my head with the sheer deliciousness of it all. I can hardly stand it just writing about it now. Yum. tallasiandude revealed his California roots with his choice, a cheeseburger with lettuce, tomato, sprouts, mayo, cheddar, and vast amounts of buttery Hawaii avocado. This too is a spectacular burger, perfectly executed. The onion rings are some of the best we've had, super sweet, thick rings with ultra-crunchy batter, and the fries are great too. I loved my papaya-and-i-forget-what-else drink, smoothie-fied with blended ice to become cool, refreshing and energizing. The marionberry shake was the only disappointment -- it was a perfectly fine shake, but not very berry-tasting, and its okayness suffered by comparison to the superlatives of everything else. We went at about 3 in the afternoon, so the lines weren't too bad. There's a few tables with umbrellas, but if you go when it's busy, you might want to get back in the car and head back to the beach for a picnic. 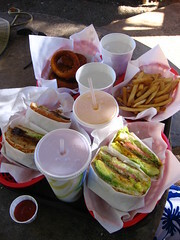 We ate a lot of good food in Hawaii, but this may rank as the single best meal of the whole trip. 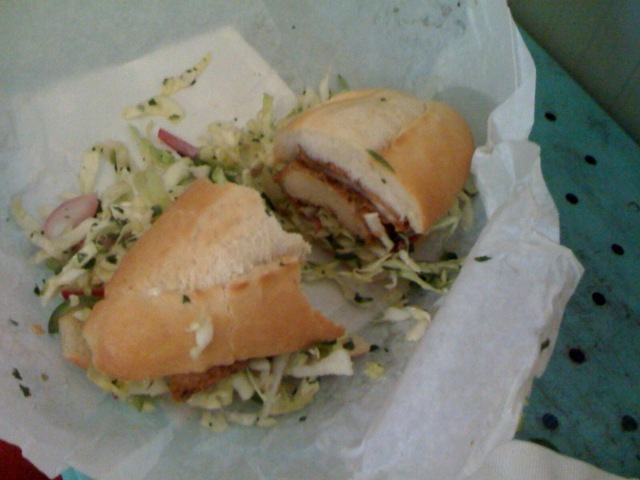 Viva Duane's! We take a break from our overdue Hawaii programming to bring you an update from Oakland, CA where i am visiting my pal R. Today we went to the farmer's market and ate a bunch of free samples (especially the breads and spreads at the Afghani prepared foods booth, YUM), bought some gorgeously cheese-tastic pastry at Arizmendi, and went for a walk through the attractively early-20th-century architecture of R's neighborhood, including a spur-of-the-moment visit to a house for sale that either of us would have bought on the spot if we had a spare $800,000. By then we were hungry again, and we headed across town to Bakesale Betty's. They have cookies and cakes, but we got fried chicken sandwiches. These somehow embody the city of Oakland to me: soul food fried chicken, on artisanal bread, with crispy crunchy fresh slaw and no mayo. They were so damn good. The chicken is boneless but otherwise strictly traditional, moist with thick, crisp, spicy crust. The slaw is full of parsley and jalapenos, giving it just a little kick and a crunchy cabbagey sweetness and a touch of vinegar. It doesn't need mayo, and in my opinion, nearly everything could stand a little mayo. Mayo would push this sandwich over the edge into decadence, and somehow at the same time would make it more pedestrian. We gobbled up every bite. Highly recommended.